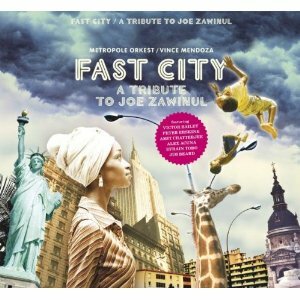 Fast City, the Metropole Orchestra tribute to Joe Zawinul, was released today in Europe. It is available from Amazon Germany. It will be released in the US on November 9 and will be available from Amazon US, among other resellers. More info about Fast City can be found here. I got a copy of Swingin’ In The Swamp the other day and I’m really enjoying it. I can confidently state that listening to this album will bring a smile to Zawinul fans. Ron cites Zawinul, Jim Beard and Scott Kinsey as influences, and that definitely comes through. Lots of funky basslines, tasty keyboard work, and world influences. Ron’s work on the drums and percussion underpins it all. It’s good to learn about a new musician making this kind of music. Keep it up, Ron! 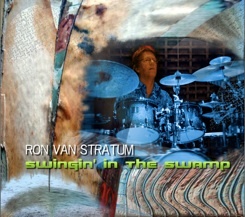 Ron van Stratum brings a very precise idea of “his” kind of music: jazz fusion with strong world music influences. He draws inspiration from greats like Joe Zawinul to whom the song “Zawinizm” is dedicated, and who has in Ron’s opinion created his very own style of music; Jim Beard who plays along on some tracks from the album and brings the composition “Ode To The Doo Da Day” along; and also from Scott Kinsey. “Swingin’ In The Swamp”, a piece characterised by Kinsey’s music and the title track of the album, was created from pure improvisation in the recording studio. It has neither a “real” theme or melody yet still holds to a traditional form. Ron van Stratum thought spontaneously of the wide swamplands in their best sense: unbelievably flexible, incredibly dense, deceptive in appearance, and always bursting full of life! After 65 years of artistic achievement, the newly formed government in The Netherlands has recommended that the Music Centre of the Dutch Broadcasting Company (MCO) be closed. This would shutter four internationally respected radio ensembles, including the Metropole Orchestra. The Metropole is the world’s largest professional pop and jazz orchestra. Renowned for its wide-ranging abilities, the orchestra performs anything from chansons to world-music, film-scores, rock- or pop-tunes as well as high-octane jazz. The Metropole Orchestra is a regular feature at the North Sea Jazz festival and the yearly Holland Festival along with countless TV and radio programs broadcast to millions. The ever-growing Dutch film and television industry relies heavily on the orchestra for its film scores. Since 2005 the Metropole has been under the baton of four-time Grammy Award winner Vince Mendoza, and can be seen frequenting the concert stage, in festivals and on recordings in the Netherlands as well as internationally. A CD of the orchestra’s tribute to Joe Zawinul is due out at the end of this month. The Metropole Orchestra is an international treasure that deserves saving. You can express your support at the Netherlands Broadcasting Music Center web site. The Syndicate has several gigs coming up this fall. The band features four members of the final edition of the Zawinul Syndicate: Drummer Paco Sery, percussionist/vocalist Aziz Sahmaoui, percussionist Jorge Bezerra, and guitarist Alegre Corrêa. Additional members are Aloune Wade on bass, Emile Parisien on sax, and Thierry Eliez on keyboards. I am also told that the band is preparing for its first recording, which will include songs that haven’t been performed by the Syndicate live, selected from Joe’s albums Dialects, Black Water, and Lost Tribes, among others. Dutch drummer Ron van Stratum sends word that he has a new CD out, Swingin’ In The Swamp, which includes a very Zawinul-esque tune, “Zawinizm,” as well as some other tasty tracks. I think I’m going to have to buy this one. It’s always good to hear folks keeping the Zawinul spirit alive. Best to Ron.